Bamz-Amschend is a vast Dwarven ruin located beneath the city of Mournhold in Morrowind. Before the disappearance of the Dwemer, the halls of Bamz-Amschend once hosted a Dwemer Council Meet. The city also housed the Skybreak Gallery, where the Dwemer constructed the Karstangz-Bcharn, a giant machine capable of controlling weather above the ground. Radac Stungnthumz, a Dwarven weaponsmith, once lived and worked in the city. Bamz-Amschend was also connected to a Daedric ruin of Norenen-dur. Later on, the city of Mournhold was built at the site of Bamz-Amschend. It was ultimately destroyed in 1E 2920 by Mehrunes Dagon, and subsequently rebuilt upon the ruins of the old city. Around 2E 583, the ruins of Bamz-Amschend housed Sotha Sil's miniature Clockwork City (or at least its Tamrielic representation). It was located in Seht's Vault, in the deepest part of the ruin. 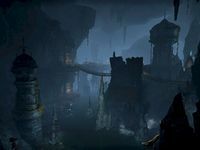 At the time, hardly anyone knew about the ruin and Sotha Sil's realm within, but a few individuals, including the Soulless One, Barilzar, and Divayth Fyr, did pass through Bamz-Amschend while en route to the Clockwork City. Bamz-Amschend was rediscovered in 3E 427, after an attack of Sotha Sil's fabricants orchestrated by Almalexia uncovered an entrance to the ruin on Plaza Brindisi Dorom. During the attack, the halls became a site of a brief skirmish between the fabricants and Dwarven constructs. The ruin was later visited by the Nerevarine, who investigated the attack on behalf of Almalexia. By the Sacred Lady's command, the Nerevarine activated the weather machine in the Skybreak Gallery to cause an ash storm in Mournhold as a show of power, and later he met the spirit of Radac Stungnthumz, who helped him enchant Trueflame, the reforged blade of Nerevar. It is unknown what became of Bamz-Amschend after the Red Year, but since Mournhold itself was left mostly intact, the ruin likely didn't suffer much damage either. This page was last modified on 21 October 2018, at 08:22.